We are a leading Manufacturer of fluidised bed processor, fluidized bed dryer, lab model fluid bed processor, powder dryer, fluid bed dryer and lab model fluid bed dryer from Ahmedabad, India. 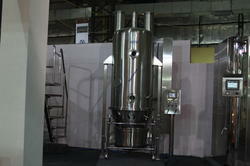 Having rich support of our expert team members has enabled us to bring forth a wide array of Fluid Bed Processor Dryer . The processor we offer is designed and engineered at our in house manufacturing base, which is outfitted with advanced machines and amenities. Furthermore, the basic material we use in the manufacturing process is sourced from trusted vendors of the market. 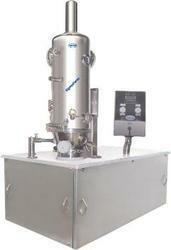 We are one of the prominent manufacturers, suppliers and exporters of Fluid Bed Dryer in the countrywide market. Our team of experienced engineers design and fabricate these products in accordance with the international quality standards, employing advanced machines and techniques. Furthermore, we utilize high-grade basic materials and components while manufacturing these products with precision. Geometrically designed conical shaped for better fluidization. Product Container made from Stainless Steel SS 316. Perforated air distribution plate along with Dutch weave mesh will be provided with quick opening toggle clamp. The unit will be double skin having 24 G GI panels in Pre filter section, Heating Zone, De-Humidification zone, Micro Vee filter, HEPA Filter section at the supply side. The unit will be double skin construction having aluminum section frame worked out duly powder coated and 50 mm thick “Glass Wool” insulated panels having SS 304 inner sheet and powder coated GI sheet for the HEPA filter section at the supply air side. 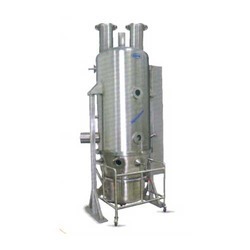 Fluid Bed Dryer are used for drying the pharmaceutical wet granules, & powder specially used in solid dosage technology. In FBD air is allowed to flow through bed of solid powdered material in upward direction with velocity greater than settling rate of particles, the solid particles will be blown up and become suspended in the air stream. Use of hot air to fluidizing the bed will increase the drying rate of material. FBD contains a SS 316 chamber having removable perforated bottom known as Product Container. Air is introducing from the bottom of container and heated at required temperature by steam or by electrical heater. Hot air is passed through filtered and then pass through the bed of the material. This air flow is generated by the blower fitted with suitable length of ducting at the service area. ü As the flow of air increase, the bed known as FBD bag, expands and particles of powder starts a turbulent motion. Due to the regular contact hot air material gets dry. Leveraging on the support of our skilled professionals, we have been able to manufacture, supply and export high performing Continuous Fluid Bed Dryer. This dryer is engineered with precision at our wide manufacturing unit, employing technically advanced machines and other amenities. Furthermore, our quality controllers check the products on defined quality parameters in order to rule our possibility of flaw. We are one of the prominent manufacturers, suppliers and exporters of Sigma Fluid Bed Dryer Lab Model in the countrywide market. Our team of experienced engineers design and fabricate these products in accordance with the international quality standards, employing advanced machines and techniques. Furthermore, we utilize high-grade basic materials and components while manufacturing these products with precision. üFBD contains a SS 316 chamber having removable perforated bottom known as Product Container. Looking for FLUID BED DRYER ?